There are 10 hands on Spelling Activities in this packet. 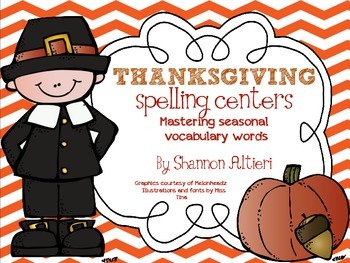 This Thanksgiving Spelling Center Pack will be great to use throughout the month of NOVEMBER. My students love doing seasonal writing activities but always seem to be stumped on spelling these special words. These activities can be used in whole group/small group or center instruction. Some of the activities also come with blank cards. You can program some of the activities to use spelling words that you use in class. If you have Adobe XI (it is free), you can add text to the documents. This way you can use your own weekly spelling lists with these fun, hands on activities!